Students often ask us, "What is there to do on a Sunday Afternoon?" How about a visit to Parque de la Independencia? 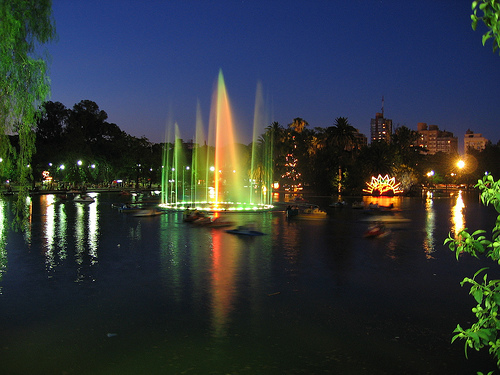 Parque de la Independecia is one of the biggest and most beautiful parks in Rosario. It is also home to one of Rosario’s famous soccer teams, Newells Old Boys. The two most well known main streets in the city, Pellegrini and Boulevard Oroño, conveniently run into Parque de la Independecia and a stroll through one of these streets to get to the park is highly recommended. On Sunday nights, families, friends, and lovers, flock to Parque de la Independencia, especially during the summer. People bring tables, fold out chairs, blankets, food, drinks, you name it, to hang out with good company and have a good time in a beautiful place. At around 9:30PM, the water, music, and light show commences. Popular music begins to blast from the speakers, waters starts to spew and dance from the middle of the lake, and lights flicker to the beat of the song. The show lasts about 30-40 minutes and is definitely something to see if you’re in town on a Sunday night. If you’re feeling adventurous and want some laughs, you can choose to ride pedal boats around the lake. For only 30 pesos for 30 minutes, you can rent a boat and pedal all throughout the lake. The boat fits up to three people, or, you can choose to go on different boats and race each other for some more laughs. Another recommendation is to rent the pedal boat during the waterworks show. Watching the show from your boat, up close and personal, is way cooler. Hungry? All along the perimeter of the park, you will find a plethora of food trucks to choose from, usually offering the usual and classic choripan for only 20 pesos. Although you can also choose from hamburgers, hotdogs, a sandwich milanesa, and a sandwich de lomito, for about 25-30 pesos. Want to make it a meal with fries? Only 35-50 pesos total! After dinner, why not have some sweets? There are carts that sell popsicles, ice cream, cotton candy, and churros. And if you only want something light, you can always opt for fresh popped popcorn. Sundays are a day to relax with loved ones, why not relax at Parque de la Independecia if you’re in town. Take a walk through Pellegrini or Oroño, ride one of the pedal boats on the lake, indulge in delicious street food for 20 pesos, and enjoy the waterworks show while you’re at it!